Notes on Blindness is the kind of documentary that aims to be formally distinct — something I wish was standard for the art. The film does more than simply tell an interesting true story which the filmmakers stumbled upon. It uses that story as a jumping-off point to explore actual ideas — in this case, dealing with the loss of a sense, and how the experience of lacking this sense can be expressed cinematically. When English theologian John Hull began losing his sight in middle age, he started narrating his life via tape recorder. Writers-directors Peter Middleton and James Spinney have edited these diaries, as well as interviews with Hull and his wife Marilyn, into an autobiography of sorts. (They initially created a short film, now been expanded into this feature.) In a manner similar to that of Clio Barnard’s masterpiece The Arbor, the audio is illustrated via extensive reenactment, with actors lip-synching the original dialogue. Unusual for a documentary, this provides ground to talk about an actor’s work. Dan Skinner gives a soulful, noteworthy performance as Hull, working around the odd constraint of lip-synching to pantomime the man’s journey. Since many of the taped diaries feature in-the-moment casual conversations between John and Marilyn, as well as cute “contributions” from their children, these recreations have an uncannily realistic, even naturalistic feel. In contrast, to express Hull’s ruminations on his condition — which include both philosophical pondering and practical thoughts on how he’s physically adjusting to these changes — the doc utilizes heightened, sometimes fantastical imagery. The directors, along with cinematographers James Blann and Gerry Floyd, use the absence of actual vision as a doorway to limitless experimentation. How do you visually represent how someone who cannot see (but who once could) processes the world around them? Much emphasis is placed on tactility, with the camera lingering on hands on objects. Even moreso, sound is brought to the forefront, as one might expect; sound editor Joakim Sundström is this movie’s secret weapon. Both senses are sometimes combined, such as in a breathtaking sequence where Hull describes how the sound of rain helps bring the entire world around him into clarity. Slow-motion rain hitting objects is a cliched “cool” film visual, and Notes on Blindness utterly reinvigorates it with Hull’s thoughtful musings. And that’s before Hull wishes he could somehow bring a rainstorm inside his own house, so as to let him “see” it all again. Since this is cinema, we can indulge his fantasy for a moment. Creatively rearranging reality to put a viewer inside someone else’s head is the finest aim of non-fiction filmmaking, and this documentary pulls that off with both stylistic panache and emotional grace. 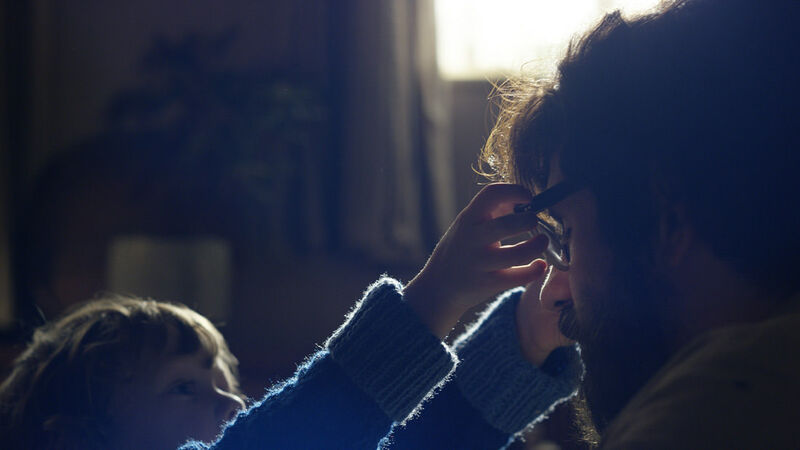 Notes on Blindness premiered at the 2016 Sundance Film Festival and will be released by Oscilloscope Laboratories on November 18.